It is in one of the largest deserts in the world as well as the largest and tallest (about 3700metres high) salt flat on the planet: the Salar de Uyuni in Bolivia. We decide to reach it from the Argentine border as we are coming from Salta, a beautiful town located northwest of Argentina at the foot of the Andean Cordillera. Strongly recommended it’s also the route from Chile crossing the stunning Atacama Desert. We travel by night-time bus and we reach the Bolivian border at Villazon at 7 o'clock in the morning. It’s freezing up here and the queue for the passport controls is incredibly long! We finally cross the border - on foot - through a bridge and we go around to look for a currency change. Indeed, we need to buy the bus ticket for Uyuni. The local bus station is really small and dirty. There is no kind of timetables but people screaming name and time of the destinations everywhere. We take then the first bus available, ready for a 10-hour trip into the desert. The bus is full of dust, very old and obviously without heating. Moreover, it is overcrowded with the corridor full of people standing there for the whole trip. During this pleasant journey, we also cross a truck coming from the opposite direction. Of course, there is no space for both vehicles to pass through. We are on a really narrow path at more than 3000 metres high. There is no other option than getting off from the bus and wait until all the men create a sort of path on the side of the street. They have been digging this improvised route for more than 2 hours. When we finally manage to leave again, the bus crashes into the truck and we lose part of the side windows. The bus keeps going with the huge hole that gives way to the freezing wind from the mountain until the driver decides to stop and fix it with a plastic bag. Once we reach Uyuni (yes, we made it! ), we pick up our backpacks - now full of dust and dirt – and we start looking for a hostel. We pay then 7 euros for a bed in a dorm. The price includes even a freezing shower which seems to be the perfect way to end this beautiful trip. Welcome to Bolivia then! 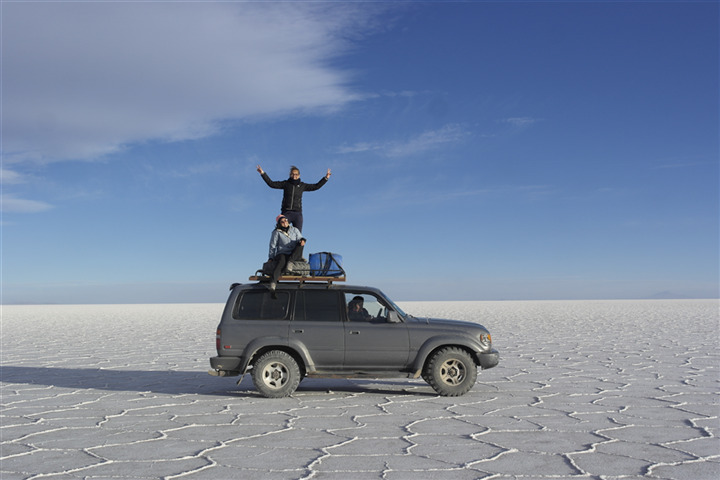 We also buy the Uyuni salt flat tour at one of the many local agencies. There is no other way to reach it except with a guided tour given the vastness of the desert. We choose the 1-day tour (paid about € 32) which includes the lunch at a local family house and then the long-awaited visit to the salt desert. There are also available itineraries of 2 or few days, but clearly more expensive. The following day begins much better than the previous one: we are ready for the trip with a 4x4 car. Our travel mates in this adventure are 4 girls from Chile who keep singing all the day long. We have so much fun with them. But we are not sure if our driver Silvio is either amazed or scared of them! In addition to the funny trip, we are in front of one of the most beautiful landscapes seen until now. The main colour here is the white which is almost blinding and seems to blend with the endless sky. Impressive and disarming for its immensity. Despite the bad conditions of the roads and the means of transport here, Bolivia can offer stunning views and landscapes difficult to ever forget. The only thing we can do, as always, is to enjoy the most whatever this country has to give and try to respect and adapt as best as we can.